The Mendocino Coast Botanical Gardens is hosting a jazz, rhythm and blues concert series over Labor Day Weekend. 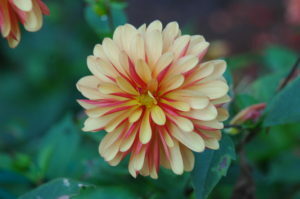 You can still buy tickets at the Gardens store, Harvest Market in Fort Bragg, Out of this World in Mendocino, and Dig! Music in Ukiah. Tickets: Platinum Club – $75, General Admission $35, Lawn Seating $20. Gates open at 2pm. No dogs, by the way. The Gardens normally allows leashed dogs, but not for these events. More details can be found on the Gardens Web site. The gardens on the tour are bursting with flowers right now!On Saturday, June 25, enjoy a behind-the-scenes, self-guided tour of some of the Mendocino Coast’s most beautiful country gardens, featuring landscaping artfully blended into the natural environment, on the Mendocino Art Center’s 19th Annual Mendocino Coast Garden Tour, Saturday, June 25, 10:00 a.m. to 5:00 p.m. The day’s festivities will also include a garden shop and plant sale at the Mendocino Art Center and a gourmet vegetarian luncheon at Ravens’ Restaurant at the Stanford Inn by the Sea, with a portion of the proceeds benefiting the Mendocino Art Center. The Garden Tour is the Art Center’s largest annual fundraiser. • An ideal coastal garden with over 200 ericaceous, cultivars, rhododendrons, pieris, azaleas, heathers and conifers, as well as other perennials viewable on the many pathways. • A lushly landscaped garden sitting on eight acres at the end of a country lane. Three acres of tended gardens are surrounded by fields, forest, and towering redwoods. • A weaver’s garden who loves incorporating color into her weaving and into her landscape design. • A garden with themed rooms, including Japanese, water, vegetable, and succulent. • The Noyo Hill Farm, located on the bluff overlooking Noyo Harbor. The owners, with their expertise and love for plants, have created a beautiful farm with organically grown fresh produce. 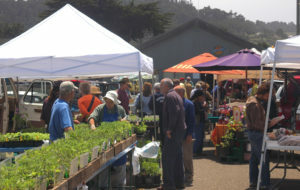 Mendocino Farmer's Market is running again! Once again, the farmer’s markets are open at towns all along the Mendocino Coast (and inland, too). I’ve been dropping by the markets in Mendocino and Fort Bragg for years, and there’s really a wide variety of produce available. You can also find cut flowers for sale, and local honey and berries, and who knows what else? 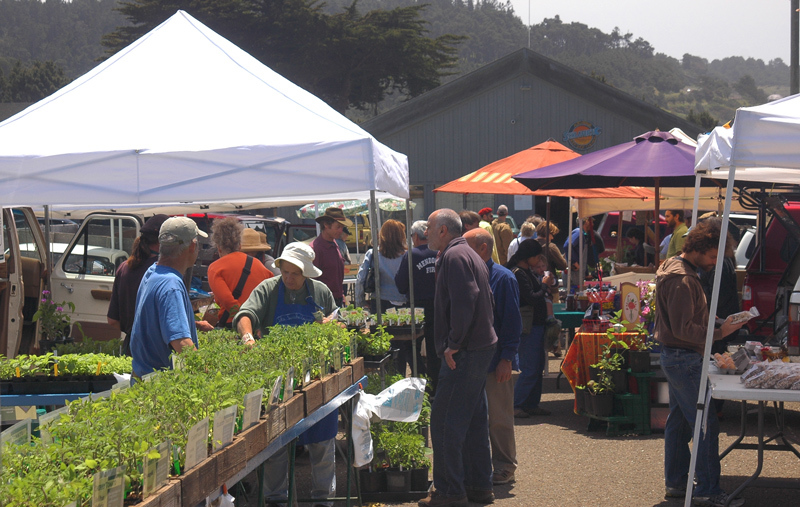 The market in Mendocino takes place on Howard Street, in the block just north of Main Street, from noon until 2:00 every Friday through October 28. The Fort Bragg market is on Wednesday afternoons from 3-6 pm in the 400 block of Franklin St, in front of City Hall. The Gualala market is on Saturdays from 9:30-12:30pm at the Gualala Community Center. The Mendocino County Farmer’s Market Association has a Web site with pointers to all of the locations in the county, and more. They’re still working on their site, evidently, but the basic info is there.